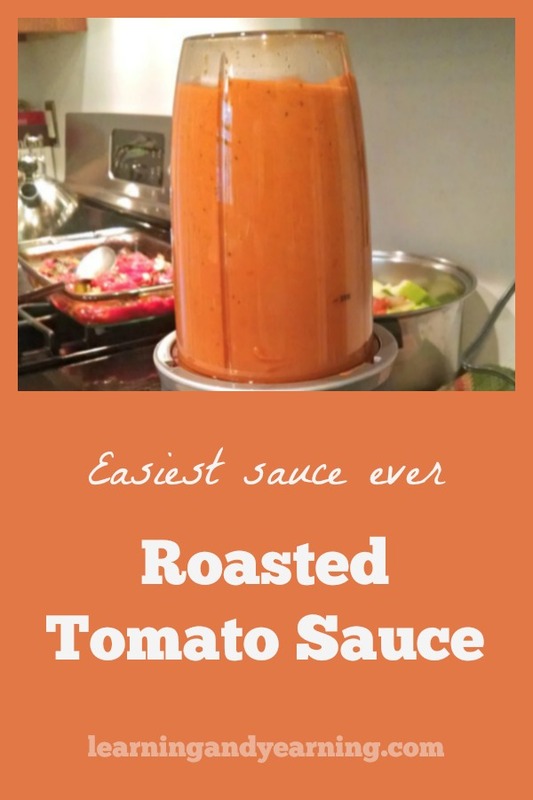 Roasted Tomato Sauce - Easiest Sauce Ever! You are here: Home / In the Kitchen / Roasted Tomato Sauce – Easiest Sauce Ever! 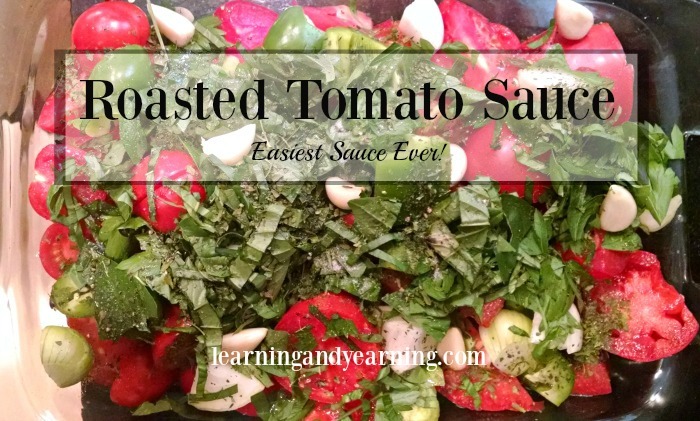 Roasted Tomato Sauce – Easiest Sauce Ever! Do you love meals with tomato sauce? Me, too. It’s one of the reasons I grow tomatoes. But I’m not so fond of sweating over a hot stove in 90°F weather all day long to make that sauce. That’s why I’m a huge fan of roasted tomato sauce – it really is the easiest sauce ever, and I promise you it’s delicious. It’s not that no heat is required to make this sauce, just a whole lot less than with traditional sauce. And no paste is required to thicken this sauce. That’s because you’ll be leaving the skins on and pureeing them and that makes a nice thick sauce. The secret to this sauce is a blender that will completely puree all the ingredients, including skins and seeds. 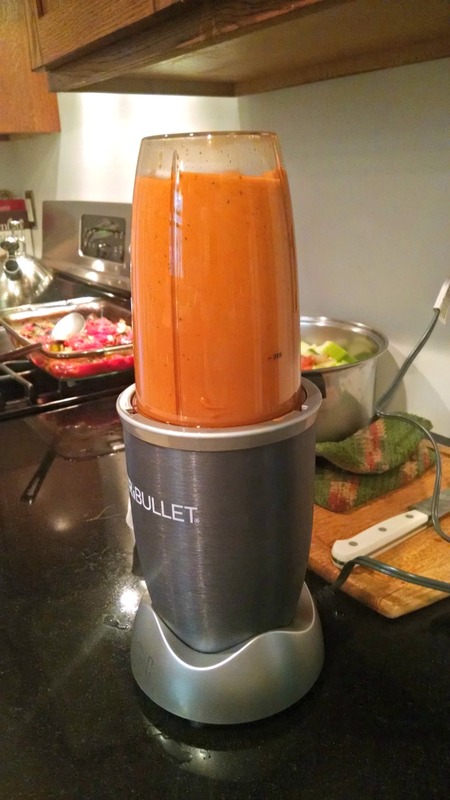 I use a Nutri-Bullet; my food processor does not do the job. I use every type of heirloom tomato that I grow in the garden in this recipe – German Pink, Mexico Midget, Black Icicle, Amish Paste . . . you name it. To that I add garden fresh peppers, onions, garlic, and herbs. A little salt and pepper, a dash or two of avocado or olive oil and you’re good to go. I use basil, parsley and oregano in my sauce, but if there are other herbs you enjoy in sauce, go for it. 2. Remove cores and half or quarter tomatoes, depending on their size. Place in 4 quart baking pan, or other roasting pan. 3. Remove stem and seeds and cut both the hot and sweet peppers into large pieces. Remove the skin from the garlic and onions. Quarter the onions. Add the peppers, garlic and onion to the pan with the tomatoes. 4. Add chopped fresh or dried herbs to taste. I use a large handful of each type of herb, fresh. 5. Sprinkle salt and pepper over everything. 6. Drizzle the oil on top. 7. Place in the oven and roast for approximately 1 1/2 hours. Stir after the first half hour to prevent the herbs from burning. Do allow the sauce to brown somewhat as this gives it a delicious roasted flavor. 8. Remove the pan from the oven and allow to cool for about a half hour. 9. Puree everything in small batches in a blender - I use a Nutri-Bullet - until all seeds and skins are pureed. 10. If the sauce seems thin, you may add it to a pot and continue cooking until thick. I rarely have to do this. This is also the time to taste and adjust the seasonings. 11. Yields 2 - 3 quarts sauce. I’ve been making roasted tomato sauce for years since I saw the recipe in a magazine. It’s good to leave the skins on for the nutrition they supply. I mix it up with the herbs, add mega-garlic to some batches. I nick-name my sauces (i.e. garlic buster, so you love basil . . . ) I made one batch last year with must green zebra tomatoes – looks a little weird, tastes great. I use the sauce on pizzas too. I love the names you give your sauce! Occasionally, I’ll add zucchini or a carrot to my sauce. Can you can this recipe ….. Pressure + citric acid….will that be safe? Hi Susan, thanks for stopping by. I’m not a canning expert so I hesitate to offer advice. I do can my sauce in a pressure canner – 25 minutes for quarts.